I start my 72 hours in Bangkok as I mean to go on. I ignore the taxis waiting patiently outside Wat Saket, the city’s ‘Golden Mount’, and seek out the ‘water bus’ which departs along the Saen Saeb khlong (canal) from Phanfa Bridge. The route map is a little tricky to decipher, but with the assistance of some friendly locals I am soon gingerly boarding, clambering over blue tarpaulin and clinging to the rope strung along the sides and across the boat’s canvas ceiling as a handrail. I take a seat on a long wooden bench as a crew member swiftly unties the craft from its temporary mooring. Other passengers pulley up the tarp to protect us from the notoriously toxic canal water, and we speed along, pausing at Bo Bae Market and Ban Krua Nua before reaching my stop at Hua Chang Bridge. 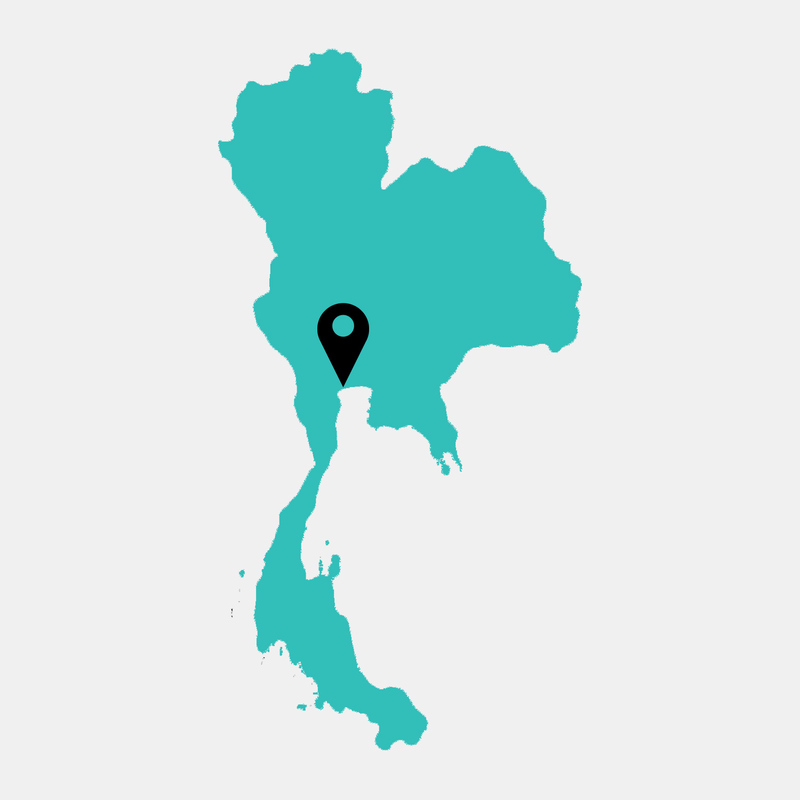 From here, it’s a short walk to the high-end retail haven of Siam, or one more hop on the boat to alternative shopping at Pratunam. 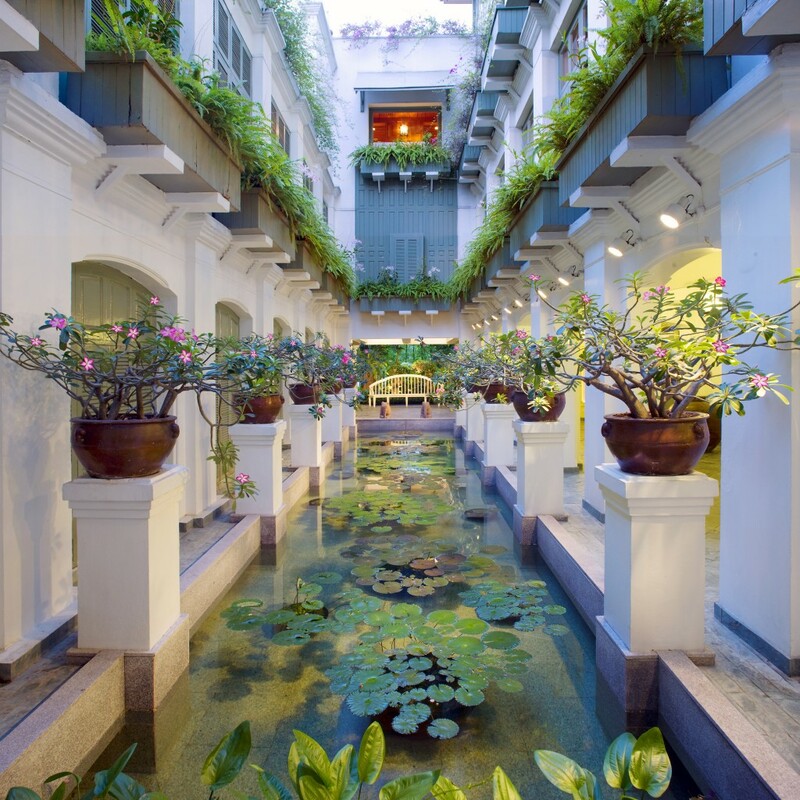 As tempting as these destinations are, today I keep my blinkers on, making a beeline for the iconic Bangkok institution, the Jim Thompson House. I stroll along one of the concrete walkways on either side of the khlong, potted plants and vines softening the impact of the railings to the side and overhead. Striking, brightly-coloured graffiti along the walls stands in contrast to the black water beneath, which is sprayed exuberantly by further passing boats. Taking a left turn, I arrive at a tall, nondescript wall, enclosing a garden compound comprising six traditional Thai teakwood houses. Jim Thompson was an American architect and art collector who settled in Thailand in the 1940s, devoting the remainder of his life to reviving the Thai silk industry. Since Thompson mysteriously disappeared in the Malaysian jungle in 1967, the house has served as his legacy, enshrining his eclectic, East-meets-West taste. It’s easy to imagine gatherings of fascinating, if privileged characters, reclining in the summer heat, fans fluttering, in the luxurious open-sided upstairs living room overlooking the canal. After some quality time marvelling at the gardens, the décor, and Thompson’s vast collections, I rest up at the house’s café next to a pond of water lilies and fat koi carp, readying myself for an action-packed afternoon. I meet the Co Van Kessel team at their headquarters at the River City Shopping Centre, on the banks of the Chao Phraya River, the historical centre of Bangkok. 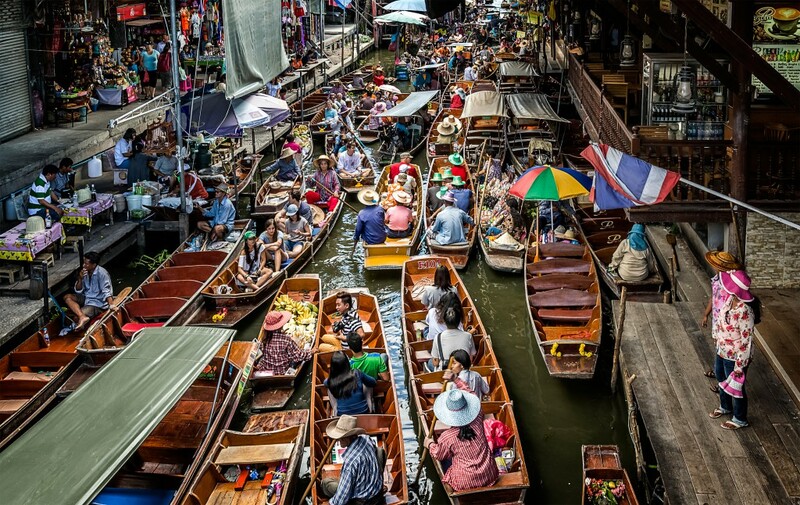 Although they specialise in tours exploring the city by bicycle, I am excited to undertake a 5-hour multi-boat tour of the river, and the khlongs of Thonburi. At Marine Department pier, we board a longtail boat, settling into low wooden bench seats, and donning life jackets — more for the benefit of any watching authorities than anything else. We are soon skimming along the murky brown river, and I begin to appreciate the tarp from my previous boat adventure as I am sprayed with water. It may not be hygienic, but it is certainly refreshing in the humidity of one of the hottest cities in the world, so I soon give up the struggle and embrace it, soaking in the spray as well as the views. 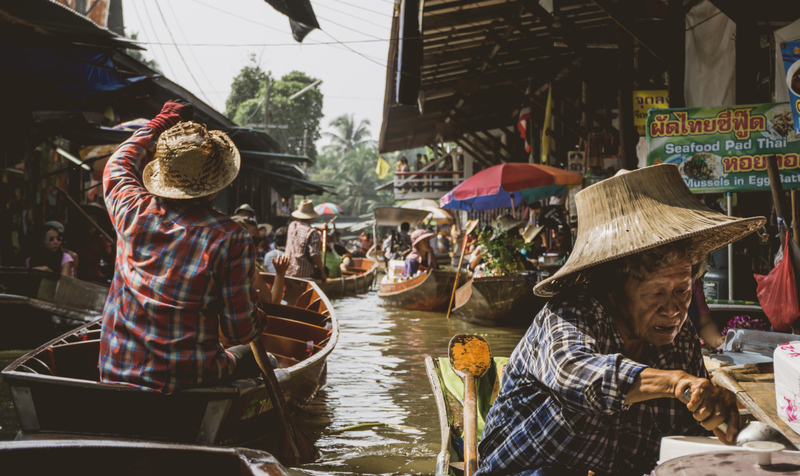 Riverside restaurants, hotels and temples are interspersed with charming stilted abodes built right on the water, and the contemporary lines of the Rama VIII bridge strike out confidently in the distance. Passing the Siriraj hospital, where we learn the royal family has taken up residence due to the king’s failing health, we hang a left and get a passing glimpse of the Royal Barges Museum, where the richly-decorated golden ceremonial vessels, headed by dragons and other mythical figures, are stored and displayed when not in use. We pass temples, factories and a navy installation, its solid, muted palette contrasting with the now more ramshackle houses along the route. We pull up at a pier to await our next ride. Power poles stand nonchalantly ankle-deep in the water, as if planted on a standard, concrete roadside. The star attraction of our tour pulls up in the form of several small ‘rocket boats’, their sharply-pointed bows a clue to their aerodynamic nature. Having gained iconic status featuring in the 1974 Bond classic The Man with the Golden Gun, the boats do not disappoint in the thrills department. We speed along the surface, whizzing under small bridges and slaloming around any obstacles, eventually slowing to a stop at a canal-side market and temple complex. The temple itself is surrounded by larger-than-life figures who merge traditionalism with contemporary culture: a dragon equipped with a walkie-talkie gives the ‘love’ hand sign: at first glance, I read this as the more metal — and incongruously hilarious — ‘devil’s horns’. However, the highlight here is the fresh pad Thai prepared by an old woman in a floating food stall. Having wolfed this down, it is back into our speed boats, to meet the longtail again on our way to the town of Nonthaburi. We alight to find a swarm of catfish jostling to be fed by those wishing to ‘make merit’ by giving back to the teeming life of the river. We purchase a loaf of bread and some colourful pellets, and track the pieces as they fall to the water and are gulped down by the ravenous fish. Next up is a market where the flipside of this exchange is apparent in many stalls displaying seafood at varying stages of the butchering process. A tiny kitten enjoys a meal of fish heads. However, balance remains, with live fish and turtles also available for purchase and release into the river, another form of merit-making. We end our journey with a river express boat, used by commuters and travellers alike to navigate the artery. Hopping on at the rear of the boat at Nonthaburi pier, this seems a more orderly, comfortable version of the Saen Saeb water bus: benches are upgraded to rows of plastic seating separated by an aisle, and life preservers hang reassuringly from the solid roof as we make our way back to base. After such a whirlwind of a day, I could not ask for a better place to retire than the legendary Oriental hotel. The first hotel in Thailand when it was built on the banks of the Chao Phraya in 1876, the establishment has gained a reputation for excellence as a flagship of the Mandarin Oriental group. The property — of which Jim Thompson was briefly a part-owner — is a celebrity favourite, particularly known for hosting renowned authors such as Joseph Conrad, Somerset Maugham, and Noel Coward. Individually-themed authors’ suites pay tribute to the sensibilities of these famous guests. It is easy to see the draw of the Oriental: even my Superior Room — a simple space, comparatively speaking — presents a level of comfort a step above anything I have experienced. Tastefully decorated in sage and neutral tones and dark teak, the room features a magical desk where I am able to charge all my devices on a built-in universal socket — but what I am truly giddy about is my newly-acquired gold-embossed personalised stationery. Stepping back in time, I can just imagine ensconcing myself here long-term, sending out thoughtful hand-written missives about my travels to friends in far-off lands. I wash the day’s grime (and river water) away in the walk-in shower, slip on a bathrobe — Thai silk, of course — and admire the view of the ‘River of Kings’ from the floor-to-ceiling window before collapsing onto the welcoming goose down bedding. Breakfast at the Oriental extends another chance to enjoy the river in style, at the Riverside Terrace buffet. I am learning quickly that nothing here is ordinary, and the buffet is no exception. Accompanied with a decent flat white and fresh orange juice, on offer is French toast with crispy bacon; croissants and camembert; hash browns, poached eggs and meatballs; dim sum; sushi, miso and seaweed salad… all executed to perfection. However, it is a divine bread and butter pudding that really stands out. By the time I have sampled as much of the array as humanly possible, the morning hustle and bustle of the river in my peripheral vision, I am more than ready to take on the day. My target this morning is Baan Silapin, the Artist’s House, a canal-side attraction back across the river in Thonburi. Just finding the place is a small challenge, but one well worth undertaking. The Oriental provides a convenient shuttle boat — in the style of a traditional teak barge — to the nearby Saphan Taksin Skytrain station, and from there I jump on the Silom train to the end of the line at Bang Wa. It’s possible to take a taxi from here, but I prefer the half-hour walk along narrow streets to the canal. A case of following my nose (and GPS map) to begin with, soon enough signs begin to point in the direction of Wat Kuhasawan, the nearby temple. I know I have arrived when I spot two life-size sculptures, one white, one red: rotund, bald figures sitting peacefully at the edge of the narrow boardwalk, enjoying the ambience of the khlong as flower garlands, potted plants and puang ma hod — colourful cut-paper decorations — sway above them in the breeze. I join them for a moment to cool down, before heading briefly to the market next door. I lunch on the best penang curry I am likely ever to enjoy, and, as if that wasn’t enough, follow up with coconut ice cream that everyone should get the chance to try, elevated with black sesame sprinkles and chocolate sauce. Reeling from such good culinary luck, I head back to Baan Silapin in time for the traditional Thai puppet show. Performed at 2pm each day except Wednesdays, such a performance is a rare find. Visitors crowd around a small garden stage, filling benches and floor space, as black-clad performers manipulate intricate puppets to perform dances and narratives drawn from folklore. At times, the performers’ actions mirror those of the puppets, and at others, they fade into the background completely. After the show, the puppets make their way through the audience, ‘hugging’ and ‘kissing’ those who make a donation — and given the impressiveness of the show, ‘most everyone does. Having browsed the extensive selection of art, crafts, books and stationery on display — I am travelling light, but for those so inclined, this would be a great place to pick up some souvenirs — I return to the Oriental to dress for dinner. Through the gorgeous lobby with its extravagant and artistic floral chandeliers, and I’m put into a waiting taxi by the supremely helpful door staff, who are emblematic of the warm welcome and impeccable service that takes a stay here to the next level. I have literally never been taken care of so well. After battling the Sathorn Road traffic, I arrive at the Banyan Tree Hotel to meet my dining companion. We are to experience the Apsara dinner cruise, but the evening would not be complete without stopping in at the hotel’s Vertigo Restaurant and Moon Bar. We take an elevator up to the 60th floor, and climb a few short flights of stairs to the rooftop high above the city. Appropriately for the time of day, I sip on the bar’s signature Vertigo Sunset as I take in the panoramic view: buildings stretch to the hazy horizon, Lumpini Park cuts a swathe of green below, and the ever-present Chao Phraya snakes across the middle distance. Evening sets in and the city lights come on — and while it’s tempting to stay for one more round, I have another boat to catch. We’re transported back to River City and from here step aboard a large converted rice barge in anticipation. The food is sublime: tasty entrees of prawn salad, snowfish, and shrimp wrapped in a coconut crepe bring around even the seafood-shy, and the tangy tom kha chicken broth is just right. The braised beef curry with perfectly crispy-yet-doughy roti, however, is unforgettable. The experience is made even more special by the ever-changing views. This is the first time I have really paid attention to some of the notable sites along the river: at night, all lit up, Wat Arun (Temple of the Dawn) and the Grand Palace take on whole new, engaging personalities. Reflecting on the other opportunities available to cruise this same route — not just the commuter ferries and longtails, but the garish party boats we occasionally bypass, blaring music across the water — I am glad to be able to attend to these sights the Apsara way. We pause for a photo op outside the palace and slide under the Rama VIII bridge — its lit-up cables even more striking with this shifting perspective — before circling back to dock. 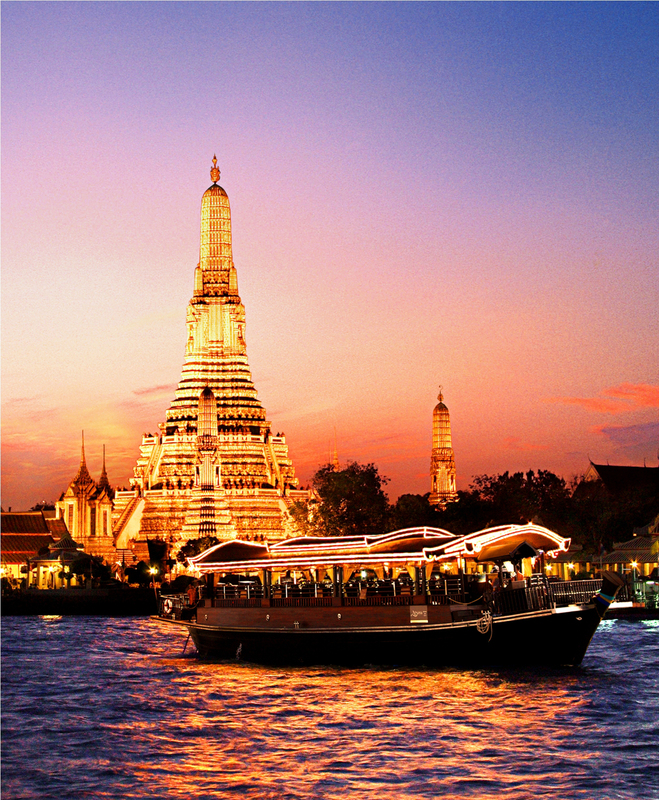 The Apsara dinner cruise passes Wat Arun on the Chao Phraya. My final day in the city is dedicated to relaxation. I escape the heat in a cabana by the pool until it is time for my massage appointment at the Oriental Spa, located across the river. I board the shuttle boat and in no time am installed in a treatment room, furnished with character and sophistication, within the century-old teak building housing the spa. The strains of my past few days of activity are worked away — at times gently, at times not so — by the expertly-administered signature massage, then I am left to enjoy the facilities. I take my time, and float out and back across the river to the hotel’s Bamboo Bar for a pre-dinner drink. Along with the classics, this classy joint specialises in signature cocktails created by in-house mixologists. The décor — part jazz memorabilia; part safari-chic; part low-ceiling, low-light speakeasy — is spot on. Making myself at home in a plush cane armchair, I peruse the menu, eventually settling on the irresistible gummy-bear-gin-based “Good Times”, followed up by the bar’s take on a negroni, given an added delicious note with a caramel infusion. I could stay here all night, but dinner beckons once again, this time at the Oriental’s Sala Rim Naam. The shuttle boat takes me across the river once more, where the trees of the spa and dining complex dangle with fairy lights, lending a whimsical air. I’m welcomed with a colombard from Monsoon Valley Wine while traditional instruments play in the background. As the first of many fine courses arrive at my table, mesmerising dancers in elaborate costumes command attention, echoing the movements of the puppeteers at Baan Silapin. Before long, it is time to depart for my late evening flight. I regretfully step onto the hotel boat one last time, and watch as the twinkling trees recede into the distance. I’ve been taken in by the charms of the river, and I know I’ll be back soon enough.